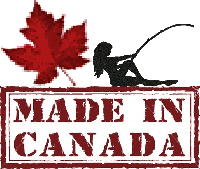 Early Spring Fly Fishing Kamloops Style – Snow Shmoe! I guess the place to start would be with what we know we have right now. Yes, I know, you are jonesing to hit open water as much as I am, but the truth of the matter is that some of the hardwater season’s best action comes as the days lengthen, the crowds clear, the snow cover melts away, and light starts to penetrate the edges of frozen lakes, stimulating (at times the last of) the aquatic vegetation to photosynthesize, invertebrates to become active, and consequently the fish to work their way out of the late winter lethargy they often experience. Further adding to the angler’s advantage on many smaller lakes with marginal dissolved oxygen concentrations is the fact that the remaining oxygen is left in a narrow band that occupies the uppermost of the water column. This concentrates the fish within this band, making them easier to locate, and hence, to catch. If you are faced with the moral dilemma of taking advantage of fish in this quandary, consider that many such lakes will experience partial or total kills and that the fish may end up on the short end of life anyway. Angling under such conditions, and possibly retaining a conservative amount of fish, should not send you on a guilt trip. Although not limited to these, any of the aerated lakes would be good bets. Explore cautiously and diligently, especially close to aerator locations! Also be aware that roads tend to undergo freeze/thaw at this time of year and things can be icy, especially at dawn and dusk. Four wheel slides backwards down hills are often responsible for wrecked vehicles, and at very least, soiled undergarments. 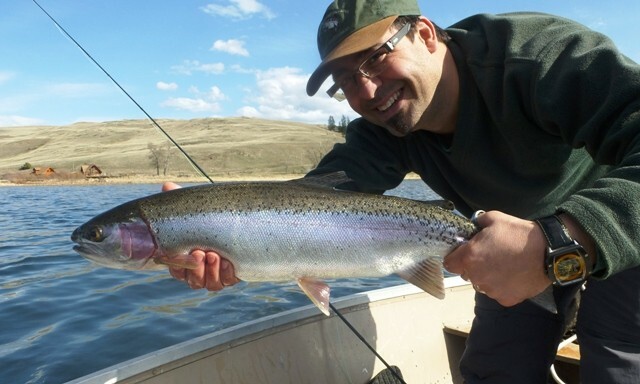 Early Spring Fly Fishing Kamloops – A Beauty Stump Lake Bow! If you’re saying, “over my dead body,” to any late season ice fishing, fear not. There is open water out there. Kamloops Lake, for example, experiences very little, if any, freezing. I have witnessed good chironomid hatches there on warm, calm spring days. I have also witnessed fish predating on emergent fry early in the year, so be versatile. While a boat increases the area available to fish from, some scouting can also turn up shore-fishing opportunities. 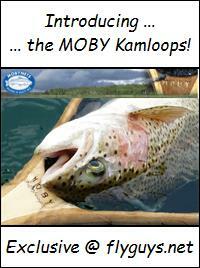 Fish species targeted are primarily rainbow trout, and less, bull trout. Vessel operators should be aware that like most large, valley bottom lakes, winds can kick up fast. Be alert and observant. This catch and release fishery is available before March 15th, after which it closes to protect rainbow trout destined to spawn in the Adams and Little Rivers. The autumn’s sockeye salmon run provides eggs, rotting flesh, and later, emergent alevins and fry to resident fish before the closure, although these reasonably fertile waters hold good numbers of invertebrates too. Note that after particularly bountiful salmon runs (2010 is a very good example) the fish have seen a hell of a lot of real eggs, flesh, and fry. Although exceptionally chunky, the fish can be very selective. Often, going with attractors of various sorts outperforms trying to imitate something they’ve seen hundreds and possibly thousands of. It is known generally for its Rainbow fishing, although a plethora of species can be and have been caught there. Known generally for trolling with downriggers, but occasionally surface action on bucktails, opportunities are generally restricted to boats. 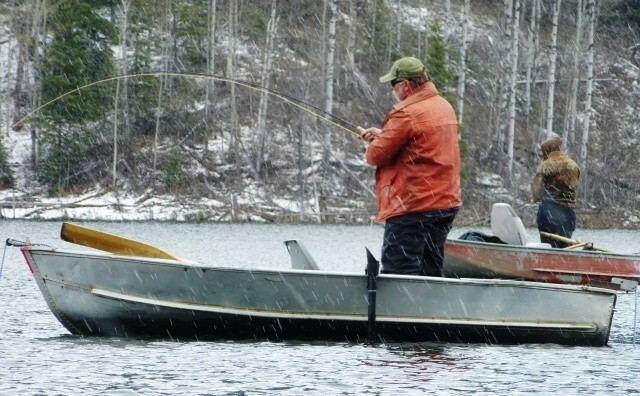 Rainbows, Lake trout and Bull trout are targeted. The main lake is a bit more hit and miss, but some shore and boat fishing opportunities can be found. If you are lucky enough to locate schools of one year old sockeye fry (that will out-migrate as smolts in late spring/early summer) stay close, as Rainbows, Lake trout and Bull trout are generally nearby. There are some terrific stretches of water. In addition to having a good invertebrate population, the river has a large Chinook salmon run, so eggs, flesh and fry imitations also work well. It is most commonly angled between Chase and the Pritchard bridge, with a few angler targeting some creek mouths further downstream. Rainbows, Bull trout and mountain whitefish are the target species. This system seems a little tougher to dial in, but can provide good results at the right times. With few exceptions, tributary mouths from Heffley Creek north are targeted, where Rainbows, Bull trout and mountain whitefish are sought. Faster water with course, round substrate seems to produce best, as the slower reaches can be somewhat inundated with silt and relatively sterile. Nicola – It’s difficult to say whether this is a large small lake or a small large lake. Either way, it is often free of ice early in the year and can fish well on chironomids or general trolling for kokanee and rainbows. Stump – Usually not far behind Nicola. Sadly, it’s going through some water chemistry issues because of insufficient recharging after years of low snow-melt inputs. Regardless, the lake does have a component of its stocked fish surviving, and they are growing very well! With patience, some good opportunities can be found as the lake has incredible hatches, even early in the season. It is also planned to receive a stocking of an alkaline tolerant strain of cutthroat trout, which if all goes according to plan, will hopefully mean opportunities for subsequent years. White – Thaws early and fishes well early in the year on chironomids. The common tactic is to fish as deep as 50’! Deep – This small lake is a short hike from Westsyde (Kamloops) and can fish well for brookies (and rainbows in select years) after ice out. 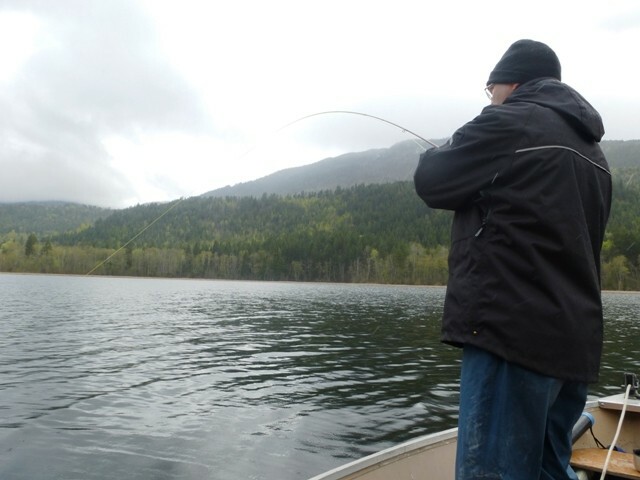 Monte – This recently established kokanee fishery is very popular at all times of year. For the open water, you’ll likely need a boat. Six Mile (Pat) – Depending on survival due to winterkill and/or pH issues, it can produce well at ice-out. If it has survived and is fishing even reasonably well, be ready for “a bit of company”. Morgan – Just past Six Mile and just a bit uglier, this catch and release fishery’s redeeming quality is that it generally has a bit larger fish than Six Mile. Unfortunately, it shares the oxygen, pH, and crowding issues. Jacko – Then again, you haven’t really experienced crowds until you’ve been to the first fishable days on Jacko. A great lake with good potential for experienced anglers, your first challenge will be finding somewhere to park your vehicle! Barnes – Generally thaws early and provides mediocre fishing for mediocre sized fish in above mediocre crowds. Tsotin – This small lake near Cache Creek is extremely turbid and shallow, and also suffers from winterkill. Nonetheless, it contains Brook trout and Rainbows and thaws relatively early. In most years, the lake is significantly drawn down by ice-out, making boat launching a muddy proposition. Beaton – In recent years this lake has been getting excessively drawn down for irrigation purposes and hence does not support fish through the winter. On rare occasions, though, the lake will go into winter with a reasonable water level, allowing fish to over-winter. Survivors tend to be chunky and grow well. The access can be muddy soon after snow melt. 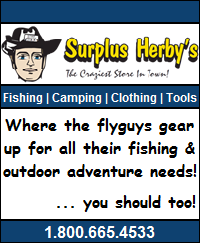 Early Spring Fly Fishing Kamloops – don’t forget your long johns! This entry was posted in Still Water Fly Fishing and tagged Barnes Lake, BC Interior Ice Off Fishing, BC Interior Lakes, Beaton Lake, deep lake, Forrest lake, Ice Off Fly Fishing, Ice Off Report, Jacko Lake, kamloops area lakes, Kamloops Area Lakes Fly Fishing, Monte lake, Morgan Lake, Nicola lake, Pat Lake, Six Mile Lake, Spring Fishing, Spring Fly Fishing, Stump lake, Tsotin Lake, White Lake. Bookmark the permalink. Awesome article! Lots of great information re early ice off fishing opportunities in our area! Thanks Benny! Great information. I enjoyed the opinions on the quality of the experience at the lakes (the description of Barnes lake and Jacko crowds was entertaining). Great article. I certainly hope ice-off comes soon. Checked out Pat Lake Tues. 29th, looks a lot like pic at the top of this page around the edge. Had interesting chat with long time local angler about when you can start fishing. He was adamant that it was April 1st although sign on road up from Hwy 1 seems to say anytime after iceout? Maybe will be academic this year as iceout may be on or after April 1st anyway. When my grandson and I arrived at the lake , there were 15 swans on the ice at the west end, maybe they know something about when the ice will finally go.